Free Shipping Included! 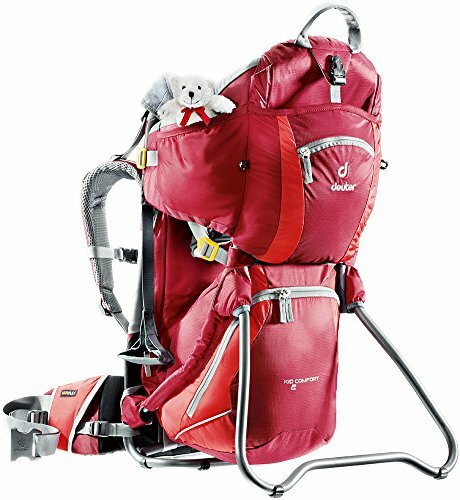 Deuter Kid Comfort 2 Framed Child Carrier for Hiking, Cranberry/Fire by Deuter at Baby Bouncers & Swings. MPN: 4651455600. Hurry! Limited time offer. Offer valid only while supplies last. Introduce little ones to the wonders of nature with comfort and ease! The Deuter Kid Comfort 2 is a bestselling favorite with kids and parents alike. Introduce little ones to the wonders of nature with comfort and ease! The Deuter Kid Comfort 2 is a bestselling favorite with kids and parents alike. Designed for that feeling of boundless freedom on longer hikes, this pack offers side step-in access, a large and super soft chin pad, a height adjustable seat, various pockets and compartments for mom or dad and has a Vari-Quick back system so transferring the load from one adult to the other is as simple as ever. JPMA certified for safety, this child carrier is ideal for kids weighing between 16 and 40 pounds who can sit up by themselves. Features and Specs - 2 grab handles makes pack easy to lift without assistance; Ample storage pockets and compartments; Compatible with 2- or 3-liter hydration systems or sun / rain roof (sold separately); Includes teddy bear; Weight Limit: 48.5 lbs (22kg). Volume: 16 L. Item Weight: 7lb 2oz (3.2kg). Dimensions: 28 x 17 x 13 in. Material: MacroLite 210 / PU Coated Super-Polytex.